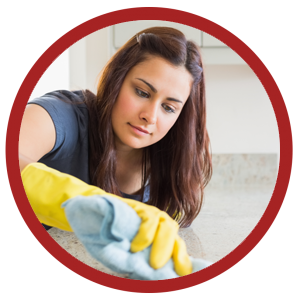 Ant control services are crucial as ants are destructive to food and property. They can also bring diseases and health risks into your home. Some species of ants can even sting and be dangerous. Ants are capable of carrying objects up to 50x their own body weight with their mandibles. There are 12,000 known species of ants in the world. A fertilized queen can lay up to 30,000 eggs a day. Ant colonies can number from 300,000 to 500,000, and whole colonies can uproot and relocate quickly when threatened. A colony can live a relatively long lifetime with worker ants living up to seven years, and the queens living as long as 15 years. Ants leave an invisible chemical trail which contains pheromones for others to follow once they locate a food source. They can enter through even the tiniest cracks, seeking water and sweet or greasy food substances in the kitchen pantry or storeroom areas. With their ability to live long lives and proliferate quickly, and the fact that there are a total of 270 different species of ants in the area, they are a fact of life in California, making it necessary to get expert ant control services. The ant life cycle has four distinct and very different life stages: egg, larva, pupa and adult. The completion of all stages is known as complete metamorphosis. It generally takes from several weeks to several months to complete the life cycle, depending upon the ant species and environmental factors. A female ant that successfully mates with a male ant will become a queen ant that lays eggs. Fertile queens select a sheltered place to begin a nest (colony) and begin laying eggs. Ant eggs are very small – only about a half-millimeter in diameter. The eggs are also oval, white and transparent. After about one to two weeks in the egg stage, a grub-like, legless ant larvae hatches. This stage has a voracious appetite, and the adult ants spend much of their time feeding the larvae with food and liquids they digest and regurgitate. After the larvae molt and shed their skin, they change into the pupal stage. Pupae appear somewhat like adults except their legs and antennae are folded and pressed against the pupal body. Initially, ant pupae are usually white, but slowly become darker in color as they age. Depending upon the ant species, pupae may be housed in a protective cocoon. Once the pupal stage is complete, the adult ant comes on the scene. At the time of emergence, the adult ant is fully grown, but darkens in color as it ages. Adult ants are in one of three different colony castes: queens, workers or males. Queens are fertile females that lay all the eggs in a colony. Workers are females that do not reproduce, but do gather food, feed the larvae, and maintain and clean the nest. Workers are wingless, and it is the worker ants that are seen foraging around for food or defending the colony from intruders. Male ants are winged and their only job in the colony is to mate with the queen during the swarming process. Effective and long-term control of ants can be challenging. Most do-it-yourself ant control approaches kill only the ants you see, leaving the colony untouched and free to continue to grow and expand for years; this approach doesn’t usually account for the fact that different kinds of ant infestations require different ant control services. Truly effective treatments consider the specific type of ant infestation present, and control not only the ants you see but also penetrate and control the nests and colonies from which they come. 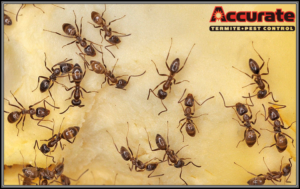 Accurate Termite and Pest Control has trained and state-licensed technicians who can identify the ant problem in your home and provide the right control program that will be most effective for you. Below is just some of the general information regarding ants that your Accurate Termite and Pest Control technician considers when making a recommendation for ant control in your home. Inspection is the first, and arguably, the most important step in formulating an effective ant control program. Accurate Termite and Pest Control will send out a state-licensed technician to investigate possible sources and areas of concern. Your technician will inspect both the exterior and interior of your home to identify the type of ant invading it. Before your inspection, consider the exterior areas mentioned and make note of any evidence of ants in those areas. Please be sure to share that information with your technician prior to inspection. 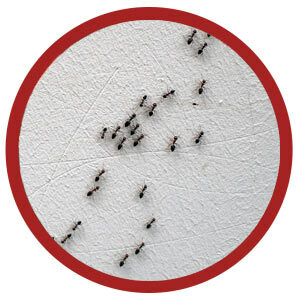 While an exterior inspection and assessment will provide your technician with needed information to possibly identify the source(s) of the issue, an interior inspection will help provide more information with regards to the best possible methods and products to include in your home’s ant control program. Before your inspection, consider the interior areas mentioned and make note of any evidence of ants in those areas. Please be sure to share that information with your technician prior to inspection. As mentioned previously, the first step in eliminating an ant infestation in your home is to identify the species of ant present. Once our trained and state-licensed technicians have obtained an understanding of the biology and feeding habits of the type of ant(s) present in your home, he/she will be able to provide a proper diagnosis and treatment plan to fit your situation. The products that your technician will include in your customized treatment program may include the use of sprays, gels and baits. Regardless of the products chosen, an Accurate Termite and Pest Control technician will never recommend or use products in or around your home that have not been properly registered and cleared for use in residential and living spaces. The actual product types are chosen carefully by your technician depending on the products’ active ingredients and label. Failure to consider which products will work best to control the ant species infesting your home may result in the counterproductive effect of having the ants go on alert and split the colony into multiple satellite colonies. This is a major risk and weakness of blanket one-size-fits-all ant-control treatment programs. Your technician will likely include products that have residuals or long half-lives in nature. These products are typically known as “social killers,” meaning they do not have the kill-on-contact effect of poisons and products typically found over the counter. They are designed to be picked up by the target ant and be shared with the colony. This may mean that you may still see minimal exterior, and possibly interior, ant traffic for one to two weeks following your initial treatment as it takes time for enough ants to pick up, travel, and share the product with the colony. (2) the product being used will produce more desirable long-lasting results as it is working to control the source of the infestation. Contact Us for more information and a quote for services. Should you still experience ants in or around your home after more than 14 days of your initial service, feel free to call our office to schedule a free follow-up treatment depending on the warranty terms offered for your service. Because ants are so prevalent in our area, they are often one of the pests that may require that your maintenance program include regular visits and service throughout the year. Your technician can offer options for maintenance programs that can keep ants at bay all year long.